Up until now the flying in New Zealand has been pretty poor. I tried to fly at Te Mata peak which would have been an awesome, sweet and choice site to fly at; to coin several Kiwi idioms. However the wind on both days that I was there, was always a westerly, which doesn’t work for the site. I did bump into a semi local pilot, ground handling on the landing field who splits his time between the UK and NZ. According to him the 12 months previously have been pretty rubbish with not so many flying days as the wind had, the majority of the time, stubbornly remained from the west. 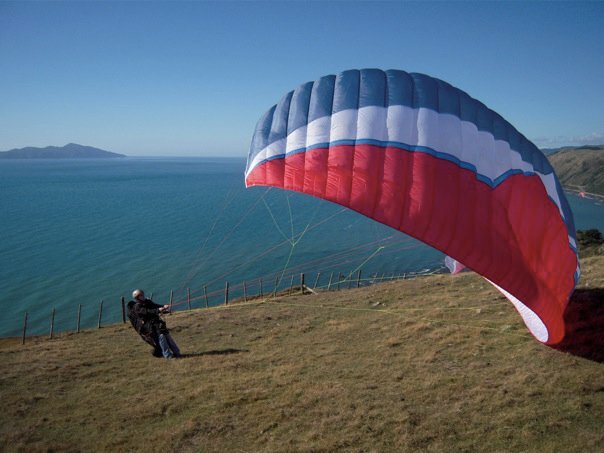 So it was onwards and downwards to the south island and Nelson, which apart from being another must do paragliding site, boosts having the most sun filled days of the whole country. It appeared that we had found the only 3 days where the sun wasn’t coming out to play. I think that my name in NZ is now synonymous with “that annoying pom” due to the fact I was constantly on the phone to local pilots trying to find out if the conditions were going to change at any point during the day, thus allowing me to get a flight in. I had originally contacted a local named Peter after posting on the Paragliding forum asking for help and advice before I arrived in country. Peter had been an excellent contact, passing me onto Tony from a local school. Tony had suffered my repeated texts and phone calls over the 3 days that I was based in Nelson, but unfortunately the weather wasn’t going to play ball. 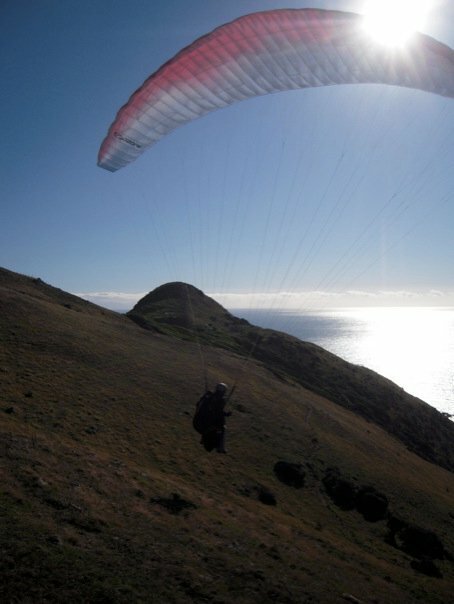 So I returned to Wellington with a unused paraglider and slightly annoyed girlfriend who had so far given up 20Kg of shoe allowance in her luggage, just to have the wing along for the ride. However continuing the help and support I had received from willing Kiwis so far, Tony gave me the numbers for a couple of Wellington club members. An initial phone call to Kris gave indications that the wind was going to be too strong over the coming weekend. Wellington is not called windy Wellington for nothing, in fact Kris when faced with the question “where do you fly in Wellington?” “Australia” is the often quick retort. Saturday morning dawned and the wind and forecast didn’t look as bad as expected, I once again set into annoying Brit mode and sent a text to Kris, who kindly suggested that couple of people might be off to fly inland, passed on my details and another round of logistics and arrangements commenced. Unfortunately the advance party arrived to find high winds and suggested that I wait around for a bit longer before joining them. Pressures of seeing friends and doing some Saturday touristy activities were mounting so I decided to bin the parawaiting and scrubbed the day myself. Sunday dawned again to light winds, and a text to Kris resulted in a possible site being on outside of Wellington, Pukerua Bay to be exact. I arranged to meet Kris outside the local diary (Kiwi for shop selling all manner of things including ice cream), and was warmly greeted by a tall smiling kiwi ready to take me flying. However this is where the problems started, and I am sure that Kris, if he knew what he was letting himself in for, would have sailed right past the diary not giving me a second glance. Things got off on an arduous start with the climb up to the launch point, which was steep and consisted of a narrow goat path running up the cliff face with an unnerving drop to the sea and rocks below. It was around this time that I began to realise that the Alpine suited harness and pod, which added considerable weight was not the best thing to bring to coastal soar in NZ. Struggling up the slope and by now joined with several local kids who seemed to have the sure footedness of the path making goats, and were climbing over the path, rocks and slope with ease, while I tried to balance the poorly packaged 20Kgs of glider and harness on my back which seemed to constantly want to lean down the slope rather than away from it. Reaching the top, out of breath and tired, Kris was laying out his glider and preparing to go, I should have spoken up about my general lack of launching into a decent wind experience but didn’t, and gave assurances that it was OK for Kris to hop off first. That was the second mistake of the day, the third being that once Kris had made the strongish wind take off look surprisingly easy, I unpacked my wing to find that I had unclipped the harness, when packing away in Bright and had left the lines in a right mess. Trying to lay out the wing and separate the lines, while the tribe of 9 year old goat/children hybrids were running around and the wing starting to self inflate (I blame the ribbed leading edge on the Buzz) was proving a mite difficult, I gathered up the wing to sit on the ground, not relishing the long walk back down and packing exercise that was to follow. Having by now resigned myself to another non flying day and scolding myself for my bravado in thinking I was prepared to fly. Bugger, that's not going to end well. to my aid. A detangling process was carried out which was then followed by several failed launch attempts. I tried several times to get the wing up and stable over my head struggling greatly with the strong wind, which to be honest was much stronger that I had encountered in the Alps back home. Kris to his credit and to my shame was supportive and encouraging with comments along the lines of ” It’s a bit turbulent ” or ” maybe we are not facing into wind” while gathering, re laying and holding my wing after each failed attempt. Finally, into the wild blue, windless yonder.. Finally, through luck rather than skill on my part, the wing came up, stayed overhead and I managed to turn and lift off. To soar away into…. sinking air, or rather wind now veering off the ridge, which to give it its credit, it had been forecasted to do. I had spent and wasted so much time that the goat children had long ago left bored and the wind had also decided to knock off for an early stack as well. A couple of beats were had in the barely supporting compression and I ran for home around the corner and the beach landing. Carrying the shame that I had wasted another pilots air time with my novice behaviour. While all the shenanigans had been going on, another local pilot had turned up and launched, Laurie had managed more than a few beats and landed and was packed by the time I had gotten into the air, failed to stay up and land. Kris soon joined me on the beach and Laurie graciously went off up the hill to get his car to transfer us back to the car park. Kris being the gentleman and possibly superb actor that he was, didn’t give any indication of being annoyed over wasting one of the few flying days that Wellington has on babysitting me and even gave me a ride back to Wellington to my friends and hosts. While driving we spoke on many subjects but one of them being the great levelling effect that paragliding has. No matter where you are in the world paragliding pilots are there to help and go the extra mile for you, be you CEO or unemployed builder we are all equal under a wing. And boy do I now have a lot of Karma to pass on! 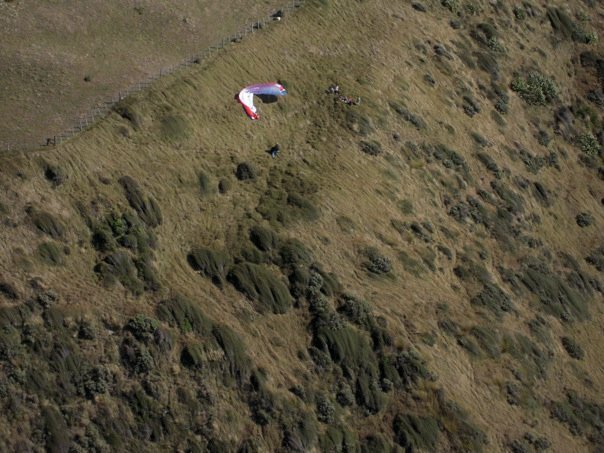 This entry was posted in New Zealand, Paragliding and tagged failed launches, new zealand, paragliding karma, strong winds. Bookmark the permalink.